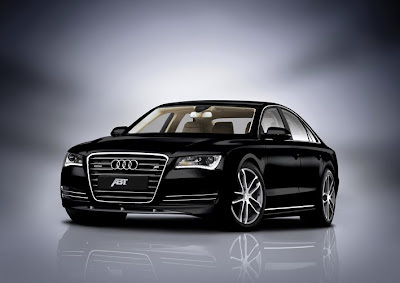 ABT Sportsline is heading to the 2010 Geneva Motor Show with a host of newly tuned Audi's that are making us drool. 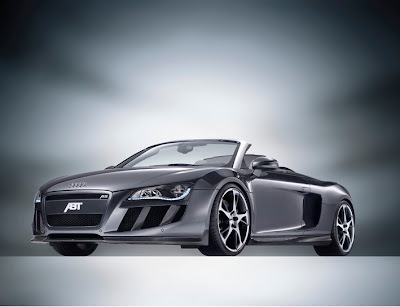 The German tuning firm has officially revealed three new Audi models; the ABT R8 Spyder, AS8 and ABT R8 GTR. Check out all the official photos and specifications after the jump. 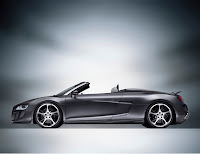 The R8 Spyder is not just a cabrio, it is a teasingly beautiful open-top sports car of the top class, a real dream car - in particular ABT Sportsline’s version. Their designers have contoured the lines of the open-top model athlete, and using the ABT R8 Spyder has redefined the word “roadster” with Bavarian thoroughness: the result is a vehicle whose power can be seen even when it is at a standstill. The front grill, front apron, side sills and rear apron with the rear spoiler as well as the dual-colour coated ABT BR alloys have been adjusted to the dynamic design of the car. As with the closed R8 versions from ABT, the team has designed all the components in order to achieve the sports car’s optimum distribution of weight; all the parts are therefore made from carbon. As a result the performance can be converted into a maximum of driving enjoyment. Anyone who wants to systematically reduce the weight of their Spyder should use the new ABT CR Superlight alloys, as they also excellently suit the character of the ABT R8. The V10 with 5.2 litre cubic capacity is used in the ABT R8 Spyder: this provides 600 well-trained horses (441 kW) – while in the series version there are 525HP (386 kW). The Spyder is able to sprint from 0 to 100km/h in just 3.8 seconds and achieves a top speed of 320 km/h. The roadster is therefore a hurricane for the road, giving lovers of fresh-air a new "tangible” term. Suspension springs from ABT provide even better handling, which in particular has a positive effect in the threshold regions of the Spyder. In addition the lower centre of gravity gives the mid-engine sports car an even more aggressive appearance. When you take a look at the car you can see that it is one of the fastest of the fast - and is really ready for anything, as you would expect from an ABT R8. Although only just released by Audi, ABT Sportsline is already presenting its version of the new premium limousine A8, the AS8. The luxury liner has been decently yet confidently tuned by the Bavarian company. “With us this extraordinary vehicle doesn’t lose its character, we underline it”, states Hans-Juergen Abt the General Manager of ABT Sportsline. Even the intention of the Ingolstadt car manufacturer to consistently focus on light construction, indicates how: the A8 is a sporty gentleman, even more so after the power treatment at ABT. Initially the potent turbo diesel with a 4.2 litre cubic capacity has had its performance improved, and other versions will follow soon. “The machine fits the large limousine perfectly”, says Hans-Juergen Abt in justification of the decision. The series standard 350HP (257kW) is raised by ABT to 385HP (283kW). The torque of the modern diesel engine is impressive: 880 Nm (series standard: 800 Nm) ensure that the luxury liner can easily cope with any situation. Relaxed journeys and sports handling at the limit – everyday business life is particularly enjoyable with the ABT AS8. This is thanks to the air suspension, which has been tailor-made to meet the demands of this extravagant car. The elegant-sporty car from Kempten also knows how to impress optically: the front spoiler, side sills, the rear aprons with the tailpipe cover and the three-piece rear spoiler underline the design of the limousine and give it a sporty touch. The new ABT CR alloys, available in expressive 20 and 21 inch sizes, are ideal additions to the overall concept: the wheel is classy, seems light yet has a powerful presence, and discreetly attracts attention. This is particularly the case in combination with the phantom-black coating, which makes the ABT AS8 look classically-modern and sublime beyond all contemporary aberrations. The fact that a touch of dynamism and aggressiveness does no harm to the luxury liner is shown in the details of the vehicle. The ABT AS8 has been optimised to meet the high demands of its drivers: ABT Sportsline has not changed the elegant glider into a racing car, but carefully into a confident and sporty automobile. 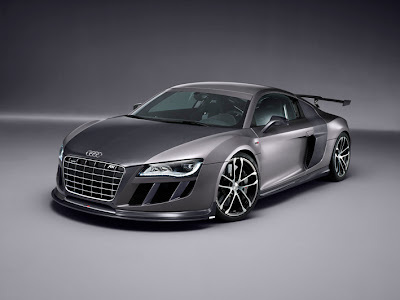 Sure, the R8 is no lame duck, and this is even more so once the sports car has been tuned by ABT Sportsline. The result is a real model athlete, which does not just ooze power, but also doesn’t have a single gram of fat on its body. With the limited version R8 GT R (with only 25 units available) engineers and designers have gone one logical step further: experience from motorsport flowed into the design, and all the components have been systematically trimmed to ensure a light-weight construction and optimal weight distribution. As a result not just the bonnet, front and rear aprons, the adjustable rear wing or the tailgate are made of carbon, but the outline edge on the rear, the external mirrors and the door panel are also made of the same material. The side windows are made of Makrolon - the high-tech polycarbonate does not just reduce weight, but also has impressive strength properties. The result: the ABT R8 GT R is a proud 100 kilos lighter than its series counterpart. How much motorsport the team, which comprises the current winners of the DTM and the ADAC GT Masters, actually brings to the road can be seen from the details: Recaro racing seats, a 4-point seat belt system, stainless steel roll-over bar with seat belt attachment, hand-held fire extinguisher or an ABT Sports steering wheel made of carbon – the people at ABT have thought of everything. “The R8 GT R is an uncompromising racing car for the road, and provides maximum performance”, states Christian Abt. The successful motorsport racer indicates his responsibility for the development of this extraordinary vehicle and is impressed with the result. “I recommend trying the GT R on a racing track from time to time, as the car is great fun to drive there", says the General Manager of ABT who is responsible for technology. The adjustable front panel allows sports inserts; the ABT driver overalls, helmet, racing shoes and gloves are just as much as part of the effective GT R special equipment as an on-board video system and the expandable data module. The well-trained sports car has enormous performance potential: instead of the series-standard 525HP (386 kW), the 5.2 FSI in the ABT R8 GT R provides a massive 620HP (456 kW) and as a result the light car travels extremely quickly: the top speed is 325 km/h, it does 0-100 km/h in just 3.2 seconds and the GT R reaches the 200km/h mark in a mere 9.9 seconds. In order to ensure that the power can be optimally applied on the road and on the race track, height-adjustable ABT Sports suspension and adjustable dampers are standard on the ABT R8 GT R. The ceramic brake system with modified brake pads has been adjusted to meet the enormous performance potential of the super sports car. The extremely light ABT CR alloys round off the package. On the front axle they are mounted in 9x19 inch and on the rear axle in 11x19 inch. The Michelin sports cup tyres are the perfect choice for the car. The ABT R8 GT R is a unique vehicle which provides maximum driving enjoyment. It has been designed for driving at the limit: from the weight-optimised exhaust unit to the ABT Titanium special coating – ABT’s love of motorsport can be seen in every detail.